If you want a funny shark t-shirt then check out this shirt. 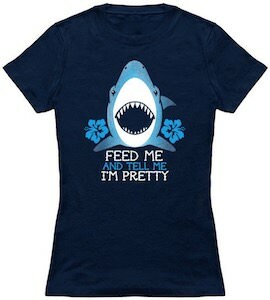 On the t-shirt you can see a shark and the animal looks pretty happy with flowers on the side and below it you find the text “Feed Me And Tell Me I’m Pretty”. You can get this cool t-shirt in a bunch of dark colors and in style for both men and women and in sizes Small – 6XL and the shark t-shirt is made from 100% cotton to be nice and comfy. Shark week or not this shark t-shirt is the one you will like to wear and enjoy.